Home » Children » Gifted Twins – What’s A Parent To Do? Parenting Talented and Gifted children is delightful … and sometimes challenging! 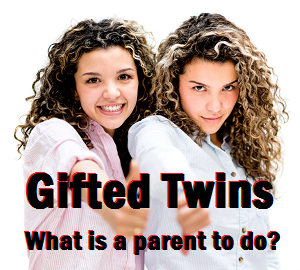 What does a parent do with Gifted and Talented Twins??!!??!! Each child is a unique blend of talents and abilities. Some areas represent high levels of ability while others represent areas with room for growth. Each child has a personal “Ability Profile” that considers a wide spectrum of skills and abilities across the entire scope of life. These abilities can be social, practical, artistic, organizational, academic, and even connected to things like nature and science. When children have some areas that are so far beyond the typical ability-level of peers and classmates, then parents may need to step in and provide some support. Bright children are at greater risk of boredom with school and other activities. An early reader, for example, is likely to feel bored and even despondent from having to sit through many hours of spelling and reading instruction during Kindergarten and 1st grade. With such boredom and discouragement come behavior and emotional challenges that are characteristic of some gifted and talented learners. When twin are gifted and talented, the landscape may change even more. When the siblings support one another’s abilities, the children are likely to help promote one another’s abilities, creating even larger gaps between the gifted children and their classmates and peers. Gifted twins who are early reader, for example, are able to support one another in becoming even better readers because of their social interaction and support. Implications for parenting and education these bright twins … and sometimes triplets and more … are tricky. The gifted multiples may prefer to interact with one another, as they feel most comfortable with their siblings and know that they share similar abilities and insights. This may interfere with socialization with peers who may not “talk the same talk” and may not be on the same ability level. Yet, socialization is a critical issue for Gifted Twins and Multiples. The socialization among siblings is important, yet children must learn to connect with and develop relationships with peers and classmates outside the family. This is the first place that parents may need to step in to support Gifted Twins in developing skills for extra-familial social interaction. One way to help Gifted Twins and Multiples develop broader socialization skills is to engage the individual children in different and unique activities from their siblings. One sibling might enjoy an art class on sketching while another might prefer water colors. In this way, siblings who share a passion for art may be able to differentiate the identity of the self while still honoring the twin or multiple relationship. Another great strategy is to help twins choose activities that complement one another. For example, one twin might pursue photography while another pursues and interest in journalism. These fields complement one another to honor the twin connection, yet each field is different enough to allow each individual child to explore and establish a unique and individualistic identity. Parents focusing on a Natural Parenting or Attachment Parenting style will want to learn how to handle the needs of the twins or multiples as a cohesive group as well as promote the individual identity of each child. In this way, children who are multiples will benefits from the unique benefits of having a same-age sibling as well as the enrichment of being connected to friends and peers in the community. These benefits are even more meaningful for the Gifted and Talented child who faces unique challenges with boredom and being misunderstood by other children and even adults who are not able to keep up with the complex thoughts of the Gifted and Talented Learner. These Gifted Twins need all the nurturing, loving, and support that parents have to give! Want to know more about some of the educational challenges faced by gifted twins? Check out this Q&A at AllExperts.com that talks about ways a parent can help gifted learners – including twins – to get the most out of the school system! Darleen Claire is a Parenting Expert with a background in Clinical Mental Health, Exceptional Student Education, and Brain-Based strategies to promote learning and development.